"'Stick and ball' begat 'racket and ball.' First, though, the sport we know as tennis had to wend its way through 'hand and ball.' Hints of a game in which the palm was used as the means of knocking a projectile back and forth date to the second century BC. More specific evidence suggests a germ of tennis emerged around the year AD 1000. European monks played a courtyard game called jeu de paume (game of the hand) behind the walls of their medieval monasteries. It is thought that the good brothers were apt to warn opponents of an imminent serve by yelling, 'Tenez,'which means 'to take' -- as in,'Are you ready to take my serve?' The name 'tennis' likely springs from these etymological roots. "Over the next centuries, the game evolved -- for example, gloves were donned to protect the hands -- and was adopted by the nobility. Elaborate indoor courts were soon being built in manor houses and palaces across Europe. The most familiar features of tennis (court, net, that weird scoring system, and -- because a blue blood's palm is at least as delicate as a monk's -- ­the tennis racket) can be traced to the indoor game that bloomed on the Continent around the middle of the fourteenth century. "Played exclusively indoors -- often in palaces, no less -- tennis was mostly a rich man's game. (The homes of regular folks just didn't have that kind of space.) And it might very well have stayed that way if not for the ingenuity of two Englishmen. On August 31, 1830, Edwin Beard Budding of Stroud, in Gloucestershire, received a patent for the first lawn mower, an invention that meant grass could be cut shorter and more uniformly than had previously been possible with sickle and scythe. Suddenly, the back gardens of England's emerging middle class were ideal locales for a spate of new sports such as lawn bowls and croquet. Around the 1860s, croquet -- with its restrictive rules and slow pace -- began to lose its new-toy luster, particularly among members of the younger generation who were looking for something more athletic and challenging. 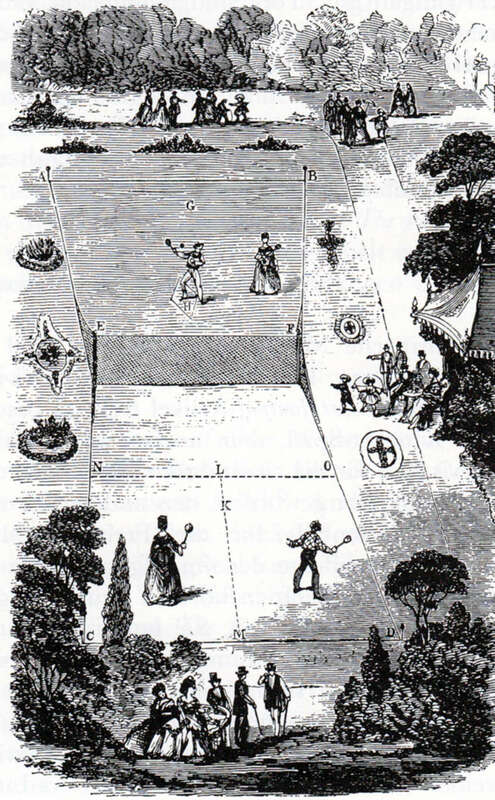 Drawing of a Lawn Tennis court as originally designed by Major Walter Clopton Wingfield in 1874. "Walter Clopton Wingfield sensed an opportunity. The retired and well-connected army captain filled the need in 1873 by marketing to the world a product called Sphairistike -- Greek for 'skill with the ball.' (Others in England at the time were reacquainting themselves with the ancient game, but it was Wingfield who rushed the net.) His portable kit featured a net, rackets adapted from the indoor version, an india rubber ball, and instructions for laying out an hourglass -- shaped playing area replete with baselines and service boxes that could accommodate two to four participants at a time. The new game was an instant hit, although the name proved a harder sell. Within a year, Wingfield's friend Arthur Balfour, the future British prime minister, convinced him to reclaim its original one. (The court shape wouldn't last, either.) Thus was lawn tennis born, and with it one of the game's three primary court surfaces. Today one of the sport's four Grand Slam events is played on grass at Wimbledon, aka the All England Lawn Tennis & Croquet Club (the sports were reversed in the name back then) -- where the first tournament was played in 1877. The rules of the game were standardized a year later. Wingfield, to his credit, made no claim to having 'invented' a new game. "His patent application specifically stated he was merely trying to simplify 'the ancient game of tennis' so it could be played in the 'open air.' Unfortunately, despite his efforts to remake the scoring system to one based on 15 'aces,' or points, that 15, 30, 40 weirdness survives."